I don’t have a whole lot of parenting advice to give out. In fact, I’ll be the first to tell you I have a lot to learn. I’m not one of those parents who reads parenting books or attends parenting workshops. In fact, I subscribe to the shoot from the hip school of parenting more than I’d like to admit. And that lecture I attended with a friend a couple of weeks ago? I felt like the dog ate my homework. What I do know is that at this Kindergarten stage of the game, I’m more concerned with Sam learning kindness and fairness than math or science. For now, I’m focused on the basics at home and I’m reassured when I find out he’s learning some of the basics at school too. Last week, I happened to overhear Sam tell someone how he’d filled a bucket that day. I figured he was talking about the sandbox until his teacher emailed parents about a book she was reading to the class called Have You Filled a Bucket Today? Curiosity peaked, I read it for myself and did a bit more research and found out about my new favorite children’s book for the holiday season. The premise is simple; everyone in the world carries an invisible bucket. 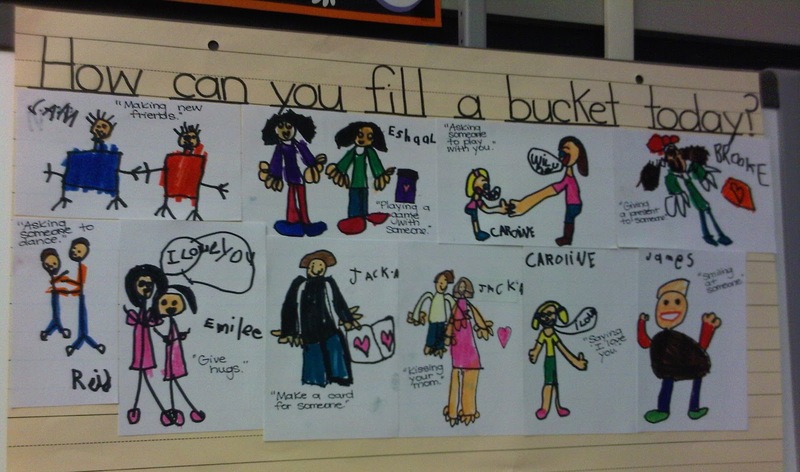 The purpose of the bucket is to hold your good thoughts and feelings about yourself. Other people can fill your bucket and others need you to fill theirs. You fill a bucket when you show love to someone, when you say or do something kind or when you give someone a smile. A bucket dipper says or does mean things that make others feel bad. 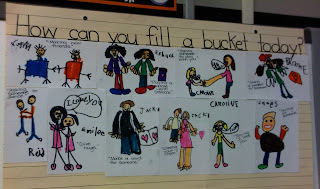 I think bucket filling is the perfect mnemonic. Get into a discussion about how your Kindergartener was insensitive or unkind and you’re on the road to him zoning out. (I tell you this from experience.) Offer a quick reminder about how taking a toy from a friend is bucket dipping and suddenly he understands. Turning an abstract concept into something visual and understandable is the name of the game. Maybe kids wouldn’t be suffering from the lasting impact of bullying if there were more effective means to teach these valuable concepts. So simple– but one that adults and children alike can benefit from. Add this one to your Christmas list. Nice post Deanna! FOr what it's worth, I think you're right not to sweat the academics at this stage of the game. Will look into the book. Thx! Thanks Deanna.. I'm going to purchase that book for a couple of my nieces who have young kids.. It sounds wonderful!! !